After visiting the town of Cittadella, we stopped to eat at the Taverna del Borgo (Tavern of the Hamlet). It was lunchtime and we were starving. We knew that close to the Bassano Door (300 metres or so) there was this tavern, whose speciality are the bigoli, a regional type of pasta, of which we are very fond. So we dashed there without hesitation. 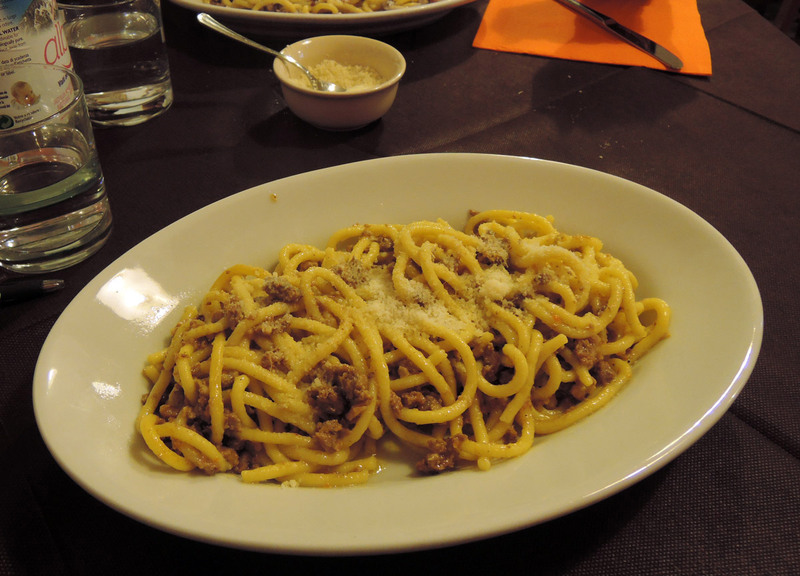 If you want to learn more about this delicious pasta, here is my post regarding bigoli. The place is very plain, a little old-fashioned. At the entrance there’s a huge counter, a couple of tables and a kitchen buffet. On the back there is another little room with only six tables. The atmosphere is friendly, quite and genuine. The menu is short. It offers only gnocchi (tomato sauce, pesto sauce or ragù, that is meat sauce) and, above all, bigoli. You can chose from 16 different kinds of sauce: duck sauce (the most traditional), meat sauce, white meat, tomato sauce, arrabbiata (peeled tomatoes, garlic and chilli pepper), amatriciana (peeled tomatoes, cheek lard and pecorino cheese), tuna and cherry tomatoes, sausage and peppers, sausage and radicchio, four cheeses, Tyrolean (speck and mushrooms), pesto sauce, cream tomato and bacon, vegetables, gorgonzola leek and speck, lobster. Main courses and side dishes are not listed and honestly we have not even asked what was available that day because we had come with a single purpose: the bigoli. We ordered the duck sauce bigoli (for me) and the radicchio and sausage ones (for my husband) and a bottle of water. After ordering, the owner brought us complimentary some mini bruschetta (tomato, olives and peppers). Quite tasty, although cold. We waited a reasonable amount of time. They say in fact that in this Tavern the cook prepares the bigoli when you order them. And so it seemed. They were perfect: abundant, tasty, with the right consistency and not too greasy. We devoured them at once! I think I’ll come back sooner or later to try different sauces. At the end we drank two good caffé. When you order “un caffè” [oohn kahf-FEH], a coffee, in Italy it is implied that it is an espresso. Are you curious to know how much did we pay? 18€. Yes, 18. Wonderful. It was a really good deal. The bigoli are charged 6€ each. The coperto (cover charge) 1€ each. Prices that you won’t easily find in Italy nowadays. What is a coperto? If you want to know, here is my post about the Italian coperto. It was a completely satisfactory experience. I totally recommend you this place if you want to have a relatively quick (the lunch took us 50 minutes) and tasty meal without paying a lot.